C. Schwarze, R. Darvishi Kamachali, C. Mießen, M. Tegeler, L. Barrales-Mora, I. Steinbach, G. Gottstein, M. Kühbach. 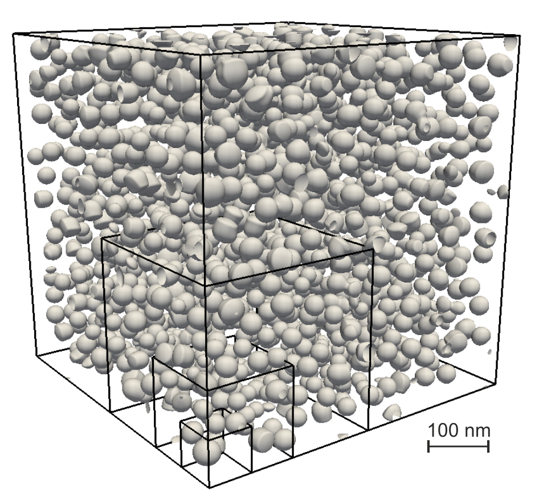 Snapshot of the particle distribution in the reference RVE (5123 nm3). The simulation box contains subdivisions of 2563 nm3, 1283 nm3, and 643 nm3. For large-scale phase-field simulations, the trade-off between accuracy and computational cost as a function of the size and number of simulations was studied. For this purpose, a large reference representative volume element (RVE) was incrementally subdivided into smaller solitary samples. We have considered diffusion-controlled growth and early ripening of d0 (Al3Li) precipitate in a model Al-Li system. The results of the simulations show that decomposition of reference RVE can be a valuable computational technique to accelerate simulations without a substantial loss of accuracy. In the current case study, the precipitate number density was found to be the key controlling parameter. For a pre-set accuracy, it turned out that large-scale simulations of the reference RVE can be replaced by simulating a combination of smaller solitary samples. This shortens the required simulation time and improves the memory usage of the simulation considerably, and thus substantially increases the efficiency of massive parallel computation for phase-field applications.